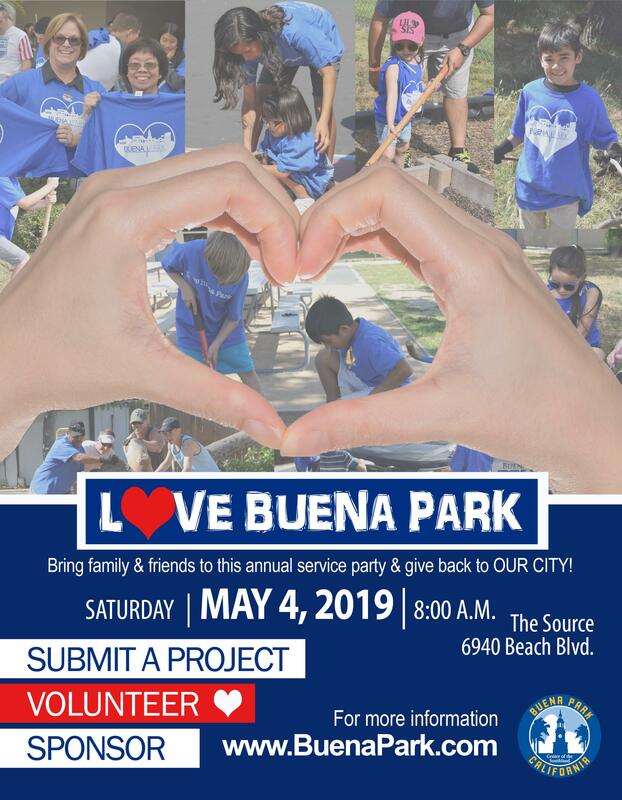 Be part of a city-wide movement on May 4, 2019, and join hundreds of your neighbors to volunteer for the fourth annual “Love Buena Park” service day. Over 800 volunteers from all areas of the community unite to complete projects that support residents, service organizations, and the City as part of the Love Our Cities movement sweeping America. Want to Be Part of the 2019 “Love Buena Park” Team? 1. Submit a Project or Donate: Please visit here to submit a community project or donate to help make this event possible. Your ideas and donations are always welcome and greatly appreciated! 2. Volunteer: Visit this page and sign up to join the volunteer service team. For more information on this year’s “Love Buena Park” event, please go to the Love Buena Park webpage or call (714) 562-3551.